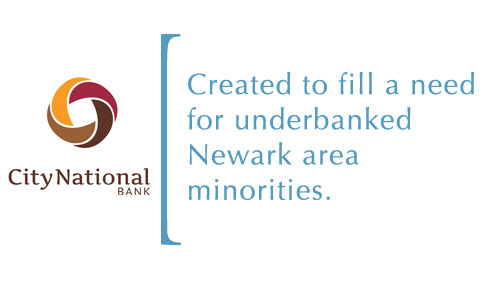 Created to fill a need for underbanked Newark-area minorities. City National Bank provides quality products and services to build strong and economically vibrant communities because the Bank believes that every individual should have access to quality education, decent and affordable housing, job opportunities, financial services, and a safe and healthy environment. City National Bank is a minority-owned and -operated depository institution serving low- to moderate -income and underserved communities throughout northern New Jersey and the New York City metropolitan area. The Bank determines success using metrics that focus on the financial and social impact made by its products, services, and partnerships to improve the lives of people and communities. City National Bank started in 1971 when a group of African-American community leaders recognized an economic void in Newark, and demand for an institution that would be sensitive to the financial needs of minority residents whose access to credit and banking services was historically limited. CNB’s ongoing commitment to provide its primary markets, which mainly include low-income and minority populations, with access to affordable credit, technical assistance, and affordable and convenient depository products has been consistent for the past forty years.